I made hooded towels for my kids when they were small and they used them a lot. They outgrew them, of course. 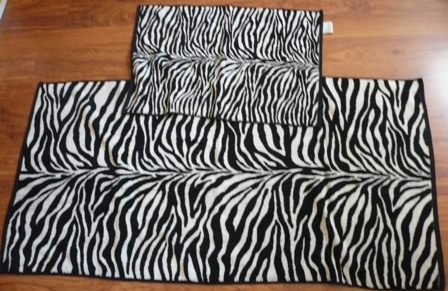 But when I spotted these zebra striped towels today, I realized that while my teenage boy would laugh his food-snarfing head off if I tried to get him to use one, the girl would love to throw one on over her swimsuit. She's about as pale as a human can be, so it's best if she limits her time in the sun. All you need to make one of these is a full-size bath towel and a smaller hand towel. Fold the hand towel in half with the right sides together. Stitch down one side with a 5/8" seam. Open the seam flat and fold the towel as shown in the photo below. Stitch straight across, 4" down from the top point. Cut off the excess 1/2" above the seam. Zigzag stitch over the edge. Turn the hood right side out. Mark the center on the bottom edge of the hood and on one side of the towel. Lay the towel out flat, wrong side up. 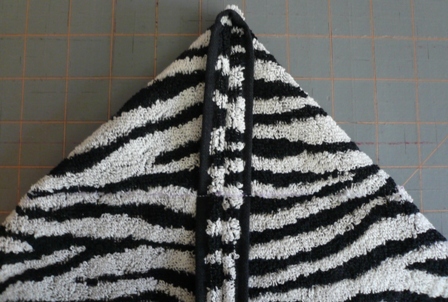 Lay the hood on top, right side down, with the bottom edge overlapping the top edge of the towel by 1/2". Match centers and pin hood to towel. Stitch 1/4" from the edge of the hood. Stitch again close to the edge of the towel. Stitch the edges of the seam down at the front of the hood. Hopefully those white stripes don't let too much sun through or she's going to have the funniest sunburn ever.